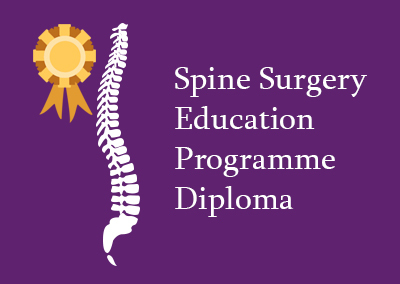 The world’s first comprehensive online postgraduate education programme in a medical sub-speciality - spine surgery. High quality medical education, to fit around your schedule. 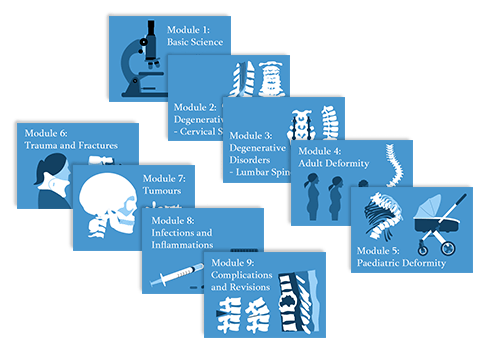 We develop distance learning modules and physical presence tutorials together with Spine Surgery leaders worldwide to provide the most relevant, cutting-edge content and education that bridges the gap between academia and practice. Access our platform whenever you have an internet connection, save articles and papers to read when you don't. In the anatomy and surgical access videos you can watch over your surgeon colleague’s shoulder while he works and follow his/her directions and comments in a structured format. From using the Spine Surgery Education Programme as a foundation or complement to fellowship training programmes or masters degrees, to provisioning Tutorials or leveraging the platform capabilites, there are many opportunities for working together for the benefit of surgeons and their patients. 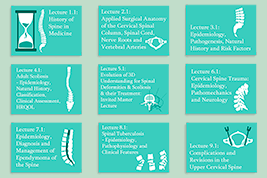 180 lectures from amongst the world's leading spine surgeons, clinicians and scientists - all experienced educators at the postgraduate level. Each lecture is augmented by comprehensive, relevant additional knowledge resources which are just one click away. Designed for Spine Residents, Fellows and established Spine Surgeons, our online Diploma in Spine Surgery and Spine Modules are the most direct route to certification in spine surgery. 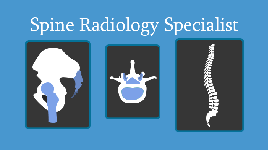 Experience the future of spine surgery education! Register for a free eccElearning account. Log in for more information and you can also try a FREE Demo Lecture and receive 3 CME Credits on successful completion. "The well-known international faculty involved in this spinal e-learning platform is of high scientific and clinical caliber, and after thorough content reviewing, the Editors deemed it appropriate to endorse the quality of the scientific content of eccElearning"
The European Spine Journal recently published an editorial about online education in spine surgery. eccElearning encourages collaboration and partnership with universities, research institutes and learned societies.